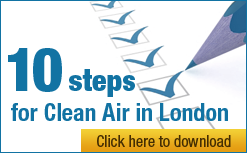 The Campaign for Clean Air in London (CCAL) has received a personal letter from Lord Coe, Chairman of the London Organising Committee of the Olympic and Paralympic Games (LOCOG and London 2012), in response to its request to him to clarify LOCOG’s stance on air quality issues for London 2012. The full text of Lord Coe’s letter is published below. A copy of his letter and its attachment can also be downloaded from CCAL’s website. Simon Birkett went on to say “The Campaign for Clean Air in London (CCAL) applauds Lord Coe for setting out this vision and responding to CCAL’s concerns at an early stage in the preparations for London 2012.
the Government, in particular the Prime Minister after four successive senior Ministers have declined to do so, must insist that the United Kingdom (UK) will comply fully with air quality laws given that it is the Government that is responsible ultimately for the UK’s compliance with air quality laws in London. Without such a commitment and the actions that must inevitably follow, LOCOG’s determined efforts will be in vain. “The good news for Londoners and all others wanting London 2012 to be a success is that the European Union finally adopted on 14 April 2008 a new Directive on ambient air quality and cleaner air for Europe. Just one its many obligations will require the UK to achieve air quality standards for particulate matter throughout London, by mid-2011 at the latest, that were breached, in London, in each of 2005, 2006 and 2007. In the very broadest terms, air pollution near London’s busiest roads must be halved before the events of London 2012 take place. Failure to comply with these new laws, which will bite in each of the next four years, will result surely in prompt and robust action against the UK by the European Commission in order to defend the latter’s international credibility not just on air quality but also on air pollution related issues generally (which include climate change). * The Mayor of London election takes places on 1 May 2008. Europe’s Council of Ministers adopted on Monday 14 April 2008 the new EU Directive on ambient air quality and cleaner air for Europe. It will enter into force in May 2008 on the day it is published in the EU’s Official Journal. The Olympic Park Code of Construction Practice mentioned by Lord Coe is still expected. Olympic Games and Paralympic Games Ltd. Thank you for your letter on behalf of the Campaign for Clean Air in London and apologies for the delay in writing to you. As you are aware, LOCOG (London Organising Committee of the Olympic Games and Paralympic Games) is responsible for the planning and staging of the Games in 2012. We fully recognise the importance of air quality, both for athletic performance and for public health and environmental quality generally and are working with our partners on a number of areas, which we believe will contribute to a healthier environment during the Games. We will operate the Olympic Park as a Low Emission Zone covering all vehicle categories entering the site. Our official vehicle fleet and fuel supplies will comply with low emission specifications and we will implement driver training and fleet logistics planning to optimise vehicle usage and fuel efficiency. It is also our aim that London 2012 will be the ‘Public Transport Games’ and all spectators and workforce will travel to and from venues by public transport, walking and cycling. We will encourage walking and cycling through an Active Spectator Programme and more than 5,000 bicycle parking spaces are planned for the Olympic Park. We will also pay particular attention to the use of healthy materials in venue overlay and fit- out and provide a utility infrastructure of sufficient capacity as to minimise the use of temporary generators. Venue Environment Management Plans will include measures to optimise efficient use of energy and appliances, minimise dust and avoid the use of volatile organic compounds. I hope that this helps to give you an idea of the range of measures that we as an organising committee are able to influence in relation to direct Games activities. Additionally, through our partnership with both central and London government we follow with interest the development and implementation of wider air quality policies. Further information is contained within our Sustainability Plan; Towards a One Planet 2012. Further to this, during the development of our Olympic facilities, all works will be carried out in accordance with the Olympic Park Code of Construction Practice. This will be published on the London 2012 website shortly and sets out a series of measures the ODA (Olympic Delivery Authority) will apply throughout the construction and legacy transformation phases to control and minimise dust and emissions from construction activities. This includes ensuring works are carried out in accordance with the GLA’s best practice guidance: The Control of Dust and Emissions from Construction & Demolition. In addition, the ODA has prepared a Dust Monitoring Scheme in consultation with the Olympic Park host boroughs. This details the monitoring for dust and particulate matter that will be undertaken during the construction phase and I have attached a copy for your information. As you are aware, the Commission for a Sustainable London 2012 (www.cslondon.org) also provides a comprehensive function of independently assuring the London 2012 sustainability programme. They will be issuing regular reports on our progress with regard to both general and specific sustainability topics. I hope that this helps to answer your questions and thank you very much for writing.